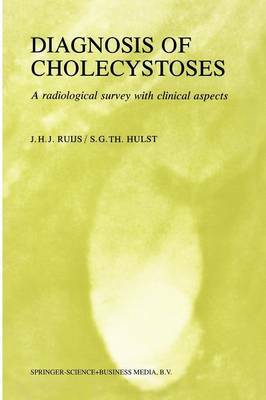 Cholecystoses, as dealt with in this book by Dr J. H. J. Ruijs, radiologist, and DrS. G. Th. Hulst, internist, is an interesting clinical and pathologi- cal entity and is unique in that it was introduced into medicine by radiological examination. Soon after the discovery of a usable contrast medium for the gallbladder examination- 35 years ago - some features of cholecystoses have appeared in publications: Rokitansky-Aschoff sinuses and adeno- myomatosis. Jutras' display at the Congress in Montreal in 1962, informed the international radiological world of the common basis for the many different manifestations of cholecystoses. Every radiologist is now acquainted with cholecystoses, but as symptoms are sometimes extremely slight - radiological technique must be exact. The aim of this book is to inform the clinician and surgeon on this clinical and radiodiagnostic entity, and to correlate symptoms and signs with the possible need for surgery. Drs Ruijs and Hulst have succeeded in presenting all this information clearly and succinctly. C.B.A.J. Puijlaert, M.D.